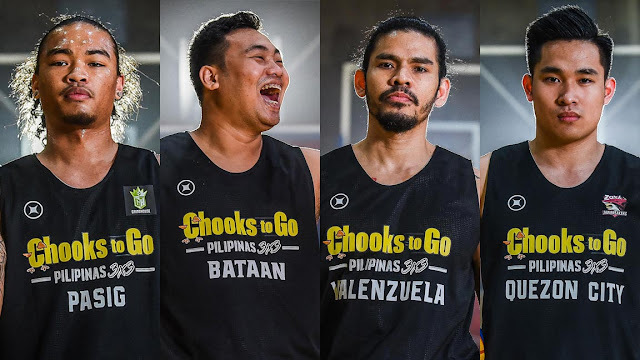 Pro basketball standouts Joshua Munzon and Paolo Hubalde and top collegiate players Alvin Pasaol and Kib Montalbo headline the inaugural Chooks-To-Go Pilipinas 3x3 league. PASIG--The road to Tokyo goes full throttle for the Philippines as one of the prime supporters of Gilas Pilipinas, Chooks-To-Go, officially launched the Chooks-To-Go Pilipinas 3x3. Fresh from organizing the biggest 3x3 event over the weekend in Cebu, Chooks-To-Go formally kicked off its 3x3 league on Monday with a press conference at the Tipsy Pig Gastropub and a preseason tournament at the nearby Ynares Sports Arena. The main tournament, however, will begin on Feb. 16 at SM Megamall in Mandaluyong and will run through six legs, culminating in the playoffs on April 6 also at SM Megamall. SM Fairview in Quezon City will also host the tournament, named the President's Cup. Twelve teams will take part in the President's Cup. Maharlika Pilipinas Basketball League sides Bacoor City, Bataan, Bulacan, Manila, Marikina, San Juan, and Valenzuela signed up for the tournament. The Dondon Hontiveros-managed Cebu-Max 4 Birada headlines the other participating teams along with Pasig-Grindhouse, Quezon City-Zark's, and Zamboanga. "The tournament is a big help for the players that will get to represent the country," said Eric Altamirano, the commissioner of the Chooks-To-Go Pilipinas 3x3 league. The 3x3 tournament will not lack quality players as aside from the key players of the MPBL teams joining, familiar faces will also suit up. Alvin Pasaol and Anton Asistio will lead the way for the 3x3 squad of the Risers, who are currently leading in the MPBL. Former Philippine Basketball Association players Ronjay Buenafe and Carlo Lastimosa, on the other hand, will play for the Stars. The Kings will bring in PBA prospects Joshua Munzon and Taylor Statham, while the Jawbreakers will be led by Kib Montalbo. "I was surprised with the quality of players we have attracted. We expect intense, close games in all legs of the President's Cup as we all witness the future of 3x3 take shape," said Chooks-To-Go president Ronald Mascarinas, who is also the owner of the league. The winner of the President's Cup will take home PHP1 million and the bragging right to be called the first champion of the league. All the teams will rack up FIBA 3x3 points as the tournament goes on, and it will be crucial in the Philippines' bid for the 2020 Summer Olympics as the countries with the most number of accumulated points will get seats in the Tokyo tournament.